Janasena chief Pawan Kalyan has congratulated KCR on his victory in Telangana Elections. 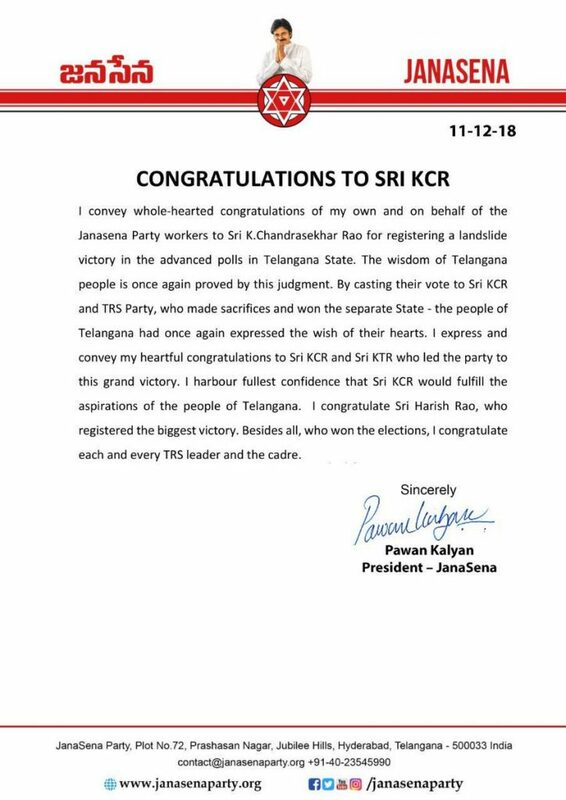 Janasena has released an official note by Pawan congratulating KCR. It is to be noted that Pawan met KCR couple of months back and shower praises on TRS government. KTR too have commended Pawan and wished he becomes CM of AP on several occasions. On the other hand, YSRCP chief YS Jagan also has congratulated KCR through twitter. He referred Mahakutami as unholy nexus between congress and TDP. Hearty congratulations KCRgaru!! @trspartyonline People have reinforced their faith in your good governance and completely rejected the unholy nexus between Congress, TDP and others. Next articleహ్యాపీ బ‌ర్త్ డే టూ ఇండియ‌న్ సూప‌ర్ స్టార్ ర‌జినీకాంత్..